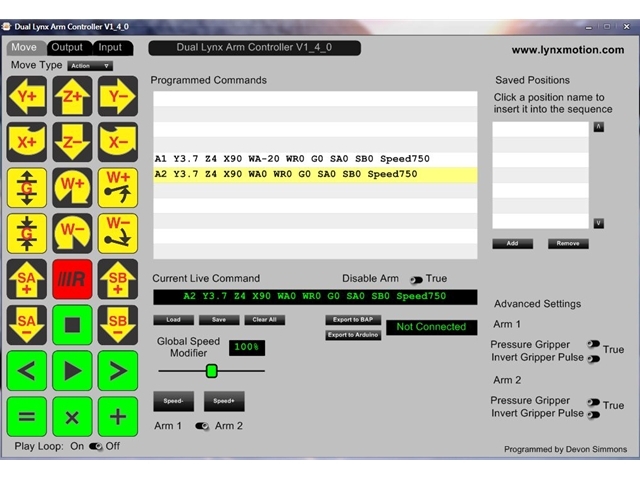 The Lynx Dual Arm Controller software set is a free FlowStone-based suite that is capable of controlling two AL5 arms using only one SSC-32 servo controller. Your robots can be taught sequences of motion using simple buttons for control. The Controller makes use of many of the useful functions that the SSC-32 has to offer. Create programs that can wait for a sensor input, control relays, turn LEDs on and off, and more. Downloads This program is legacy and is currently not supported. Bugfix in speed for arm2 for controller. FlowStone source files included in installation directory after install. Time parameter changed back to speed. Speed is measured in microseconds per second instead of the move taking a certain time in milliseconds. Player now plays from the point highlighted. On-screen list now animates to follow the player. You can now disable the arm while moving through the command list. Same as previous, except now has an installer .exe. Adds support for Inputs. See Controller notes in zip. The Controller can now control the sixteen spare channels on the SSC-32 not reserved for two arms. The 'Speed' parameter is now 'Time'. The time the arm takes to complete a move is now represented by a value in miliseconds µS instead of a percentage. Includes FlowStone source files for both the Configuration and Control programs. The calibration program now features a smaller, more streamlined interface. Only relevant items are shown on the screen at one time. The file created by the calibration named 'ArmCalibration.txt' must not be edited by hand nor can it be renamed or moved. The program contains instructions for use throughout the process.